I really ought to post more classical albums. There’s some really terrific stuff in that mega-genre, and while some of it is geared for pampered victorian prunes, plenty of it can be enjoyed by those with a flair for the earthy wilderness of folk music, like myself. With that said, I’ve noticed that the classical pieces I tend to gravitate towards are for small ensembles. Maybe it’s because a group of 4 musicians can just play so much more together than 80 or 100. And because I like to hear the sound of the instruments and hear their overtones, which get lost when you move to a symphonic scale (though you gain other shimmering qualities). Of course, another reason I don’t post a lot of classical music is that I’m not enough of a follower of the classical blogs to know what’s out there and what’s not, nor am I enough of a connoisseur to be able to have a lot to say about the works. It seems that to be a classical reviewer, one needs to have an encyclopedic knowledge of other versions of whatever piece one is describing, in addition to having a keen enough ear and long enough attention-span to say something meaningful. And I’m a young lad. I don’t have those things. Even my frequent trips to the library to procure and rip whole sets of classical performers, composers, etc. have had small effect on me. I cut my teeth on heavy metal and prog-rock, before I turned to folk and blues and bluegrass. I just don’t have a classical ear. What I do have, however, is a cheerful irreverence to tradition and a fresh perspective that comes from the hodgepodge of musical ephemera that is the source material for my life. And I have the advantage of never having studied music in any formal capacity. So I relate to this music like any string band or dixieland band or bluesman. I just listen. And I notice a few things. Chamber group using the instruments of the mandolin family (two mandolins, mandola and mando-cello) to perform classical and contemporary compositions from around the world. 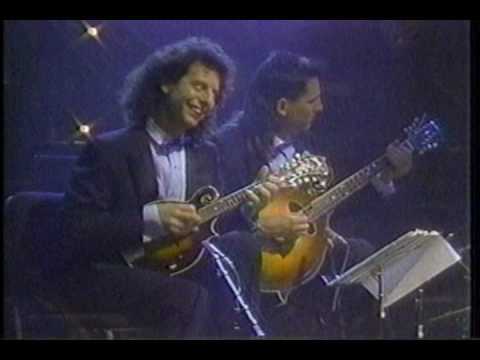 The Modern Mandolin Quartet was formed in 1985 to give a new voice to that most American of musical instruments, the mandolin. Following the tradition of the mandolin orchestras and chamber groups from the early twentieth century, the MMQ uses the instruments of the mandolin family which correspond to the conventional string quartet (two mandolins, mandola, and mandocello). The Quartet’s goals are to introduce audiences to the modern mandolin family of instruments, to increase the repertoire of original and arranged music for the instrument, and to bring the mandolin into the next millennium by commissioning new works. Their early recordings, Modern Mandolin Quartet and Intermezzo, were explorations of the world of classical music using mostly transcriptions; Nutcracker Suite featured the first piece composed for the group, the first guest artists and the first complete transcription of a major work. 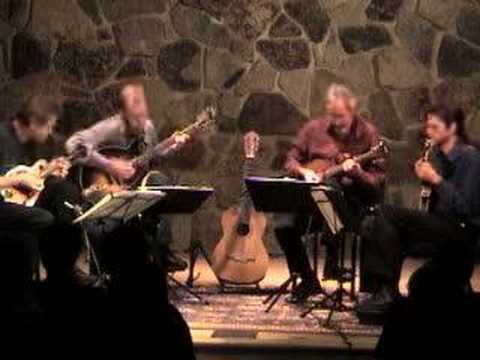 Their 1994 recording, Pan American Journeys, explored music of the Americas; their 1999 recording, Modern Mandolin Quartet – Interplay, features pieces specially commissioned from David Balakrishnan (of Turtle Island String Quartet fame) and Utah composer Tully Cathey, as well as a string quartet by Terry Riley. The Modern Mandolin Quartet members are Dana Rath and Matt Flinner (mandolins), Paul Binkley (mandola), and Adam Roszkiewicz (mandocello). The members of the Quartet come from diverse backgrounds including classical, jazz, rock, and folk. 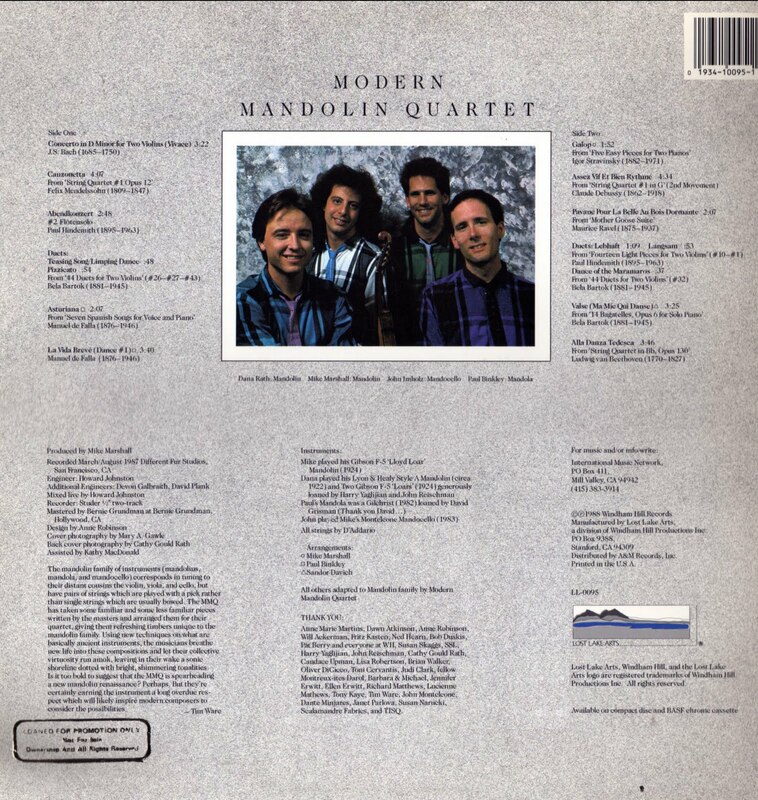 To date the Quartet has arranged and performed over 90 works originally written for orchestra, chamber ensemble, piano, guitar, and string quartet, including arrangements of traditional classical music (Vivaldi, Bach, Corelli, Mozart, Ravel, Bernstein), string quartets (Mozart, Bartok, Dvorak, Villa-Lobos, Terry Riley), music from the mandolin’s historical roots, (American Bluegrass, Brazilian Choro, Italian folk songs), and commissioned works (David Jaffe, Tully Cathey, David Balakrishnan, Philip Bimstein, Larry Polansky, and Edgar Meyer). 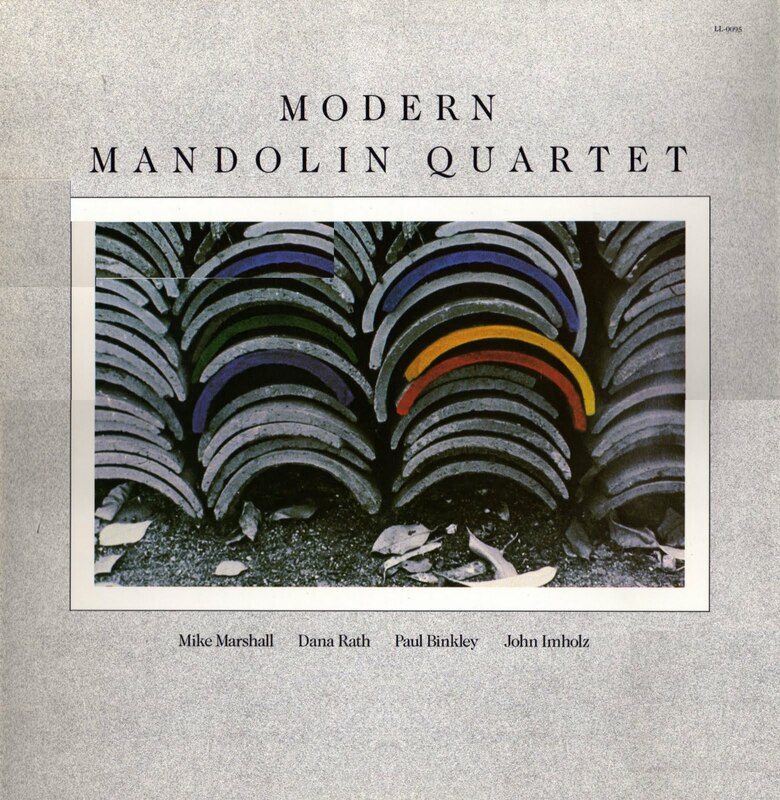 The Modern Mandolin Quartet began recording in 1988 with Windham Hill/BMG; they have released four albums to date, with sales in excess of 130,000 units worldwide. In addition to their own albums, the group appears on samplers from Polygram Records, Well Tempered Productions, and Acoustic Disk. In 1994 the Quartet received a National Endowment for the Arts Chamber Music grant to tour and perform new American music. They are the 1995 recipients of a grant from the Meet the Composer/Lila Wallace – Reader’s Digest Fund Commissioning Program, which funded David Balakrishnan’s Interplay and Tully Cathey’s Elements. These works premiered in 1997 at Merkin Hall in New York City; both are featured on Interplay. A fine debut for Windham Hill, it’s not quite as sophisticated as Intermezzo. oh, and if any of you have Modern Mandolin Quartet – Interplay or the 2004 Re-Recording of Nutcracker Suite, I’d love to hear ’em! This entry was posted in classical, fruits, mandolin. Bookmark the permalink. i'd forgotten about these guys.